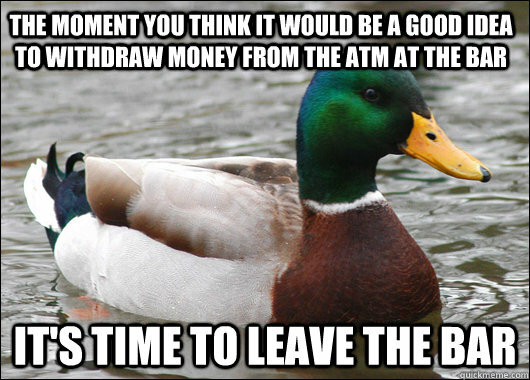 The moment you think it would be a good idea to withdraw money from the ATM at the bar It’s time to leave the bar. Happy Saturday! As a reminder watch out when withdrawing money from ATM’s as they will charge you fee’s as high as $3 to withdraw money if it isn’t your own bank. If you are at a bar and have run low on money maybe it is best to slow down for the night or to head on home.